A political chess game in London continues Wednesday as lawmakers will vote on a motion of no confidence against the government submitted by Labour Party leader Jeremy Corbyn after Prime Minister Theresa May’s Brexit deal was voted down by parliament. The House of Commons will debate on confidence in the Brexit government led by May and the motion will be voted on in the evening. In the meaningful vote held Tuesday night in Westminster, British lawmakers rejected May’s European Union withdrawal agreement after 432 of them, including 118 from her own Conservative Party, voted against it. "It is clear that the House does not support this deal," May said in her statement following the vote. "But tonight’s vote tells us nothing about what it does support. Nothing about how -- or even if -- it intends to honour the decision the British people took in a referendum Parliament decided to hold." May said if the Labour Party leader submits a motion of no confidence, it would be debated on Wednesday. Speaking after May, Corbyn said he submitted a motion of no confidence in the government, as the defeat was the greatest against a serving government since the 1920s. He said the “government has lost the confidence of this House and this country”. “The government should accept that the U.K. will stay in the customs union for good, that a no-deal Brexit is not an option and that the rights of EU nationals will be accepted,” Corbyn said. May took over the Conservative Party leadership after the resignation of former Prime Minister David Cameron, the architect of Brexit, right after the June 23, 2016 referendum with which U.K. voters decided to leave the EU. She lost the party majority in the House of Commons after the June 2017 snap election but survived as prime minister in the minority government supported by Northern Ireland’s Democratic Unionist Party (DUP) in a so-called confidence and supply agreement under which the DUP agreed to vote with the Tories on cornerstone bills and to fall in favor of the government in votes of no confidence. The government’s future now lies with the vote of no confidence, but most of the Tory MPs are expected to vote for the government. The DUP have already said they would vote for the May government. If the government loses the vote of no confidence, the Conservative Party will have 14 days to regain confidence from the parliament, whether with May or with a new party leader. Main opposition Labour Party will also have 14 days to form a government and receive confidence from the House. If both parties fail to gather enough MPs to vote for confidence in them, a general election will automatically be triggered and a five-week-long election campaign will start. But if the government loses confidence with the votes of two-thirds of parliament, the Labour Party will have a go to form a government and seek confidence. What follows vote of no confidence? If the May government wins the vote Wednesday evening, the prime minister is expected to come back to parliament Monday to explain her Plan B. 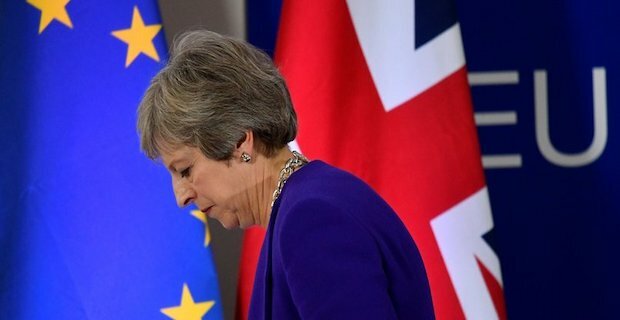 May has insisted that the rejected deal was for the best interests of the country and the alternative was leaving the EU without a deal. However, she is expected to go back to Brussels to renegotiate the backstop clause of the deal -- an option the EU already said they would not discuss. If May returns to London with a newly negotiated deal, depending on a new vote on the new deal, Britain may avoid a fast-approaching no-deal exit. However, it is not likely to be able to do so, as it would be a huge task to satisfy all, and it may not be possible to do it without extending Article 50. The U.K.’s departure from the bloc with no deal may have catastrophic effects on Britain’s economy, trade and social life as it will become a “third country” to the EU on March 30. As the possibility has now risen, EU officials said they will continue preparations for the U.K.'s "disorderly exit" scenario. "We will continue our preparations for all outcomes, including a no-deal scenario. The risk of a disorderly exit has increased with this vote, and while we do not want this to happen, we will be prepared for it," Preben Aamann, the spokesman for European Council President Donald Tusk, told Anadolu Agency. As the U.K. will leave the bloc in March 2019, the border between Northern Ireland -- a U.K. territory -- and the Republic of Ireland will remain as the only land border between the U.K. and the EU. The border at the moment is invisible, and people, goods and services can travel through it freely. But as the U.K. leaves the EU, the border, technically, will need some sort of checks. Due to the sensitive nature of the region and because free passage is one of the crucial articles of the 1998 Belfast Agreement, the U.K., EU, Northern Ireland and Ireland all reject the idea of returning to a hard border where checkpoints and customs buildings will need to be installed. The border issue has been one of the thorniest in Brexit talks, as a solution that would be acceptable for all sides could not be reached. The main disagreement over the border issue has been over an EU-suggested backstop -- keeping Northern Ireland in the EU single market and customs union after Brexit until a solution is found -- because it would create a sort of a border within the U.K. in the Irish Sea. May has continuously said they would not give in to any solution that would divide the U.K. The DUP, which is also Northern Ireland’s biggest political party, has said it would not agree on any final deal that would separate Northern Ireland from the rest of the U.K. Therefore, May negotiated a backstop for the whole of the U.K. and the rejected deal included this new kind of backstop.